As the summer has progressed, so has my riding, despite some intermittent time off here and there for business trips and vacation. I’ve also been aided by my friends Natalie, Carson, Lauren, and Aubrey. They’ve all been riding Derby while I’ve been away, and Carson even took him out on the trails where he was reported to be a star! Derby, with Carson up, out on the trails, with Christy and Liam. Photo by Natalie, who was aboard Eliot at the time. 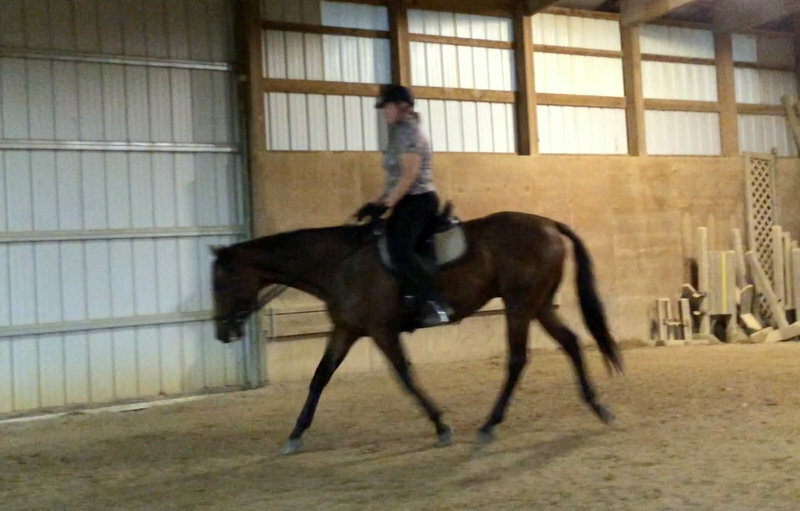 Between improvements in Derby’s fitness and my own riding, things have been on the upswing. 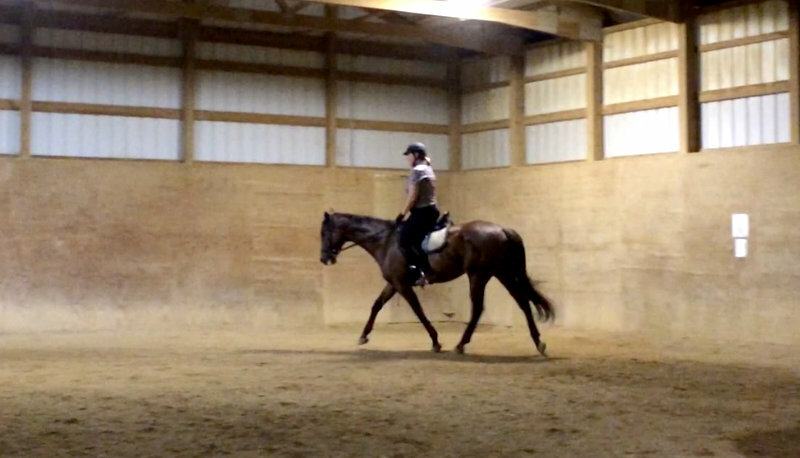 I’m getting Derby more engaged than ever before, with really solid connection that is passing the “stretch” test – if you give the horse more rein, he should follow it down, maintaining the contact. I can really feel his back coming up underneath me, and I can get a nice stretchy trot and connected free walk, to boot. We had a really nice ride early last week, on a night that the horse was coated in mud and my phone was dead. Despite the fact we had some nice work I’m glad there is no footage. I was running late, and scraped off only as much crud as was necessary to get the saddle on him and away we went. George Morris definitely would not have approved. Despite our deplorable turnout, the ride went really well. Christy said it was the best work we have produced to date, and it felt fantastic. I was able to put the horse together, and really start generating some power from his back legs. His back was up and he was really using himself well. Those moments when I get it right are breathtaking and addictive. I feel like I’ve got the saddle sitting on top of the Maserati. And it’s such a cool thing feeling the horse’s come up underneath you and all that power start to come from the back end. The changes that I’m seeing since this step forward in our work are interesting to observe. Derby is much more inclined to stretch than he was previously. When I give him the room to stretch, he eagerly takes advantage of the opportunity. He’s even changed his way of going on the longe line – I longed him today for a few minutes and he stretched himself out and down of his own volition, nose almost to the ground. This is an entirely new thing for Derbs. In addition to his adventure on the trail with Carson, Derby and I also practiced going through puddles when a wayward storm blew a ton of water in through the side door, creating a swamp that lasted several days. 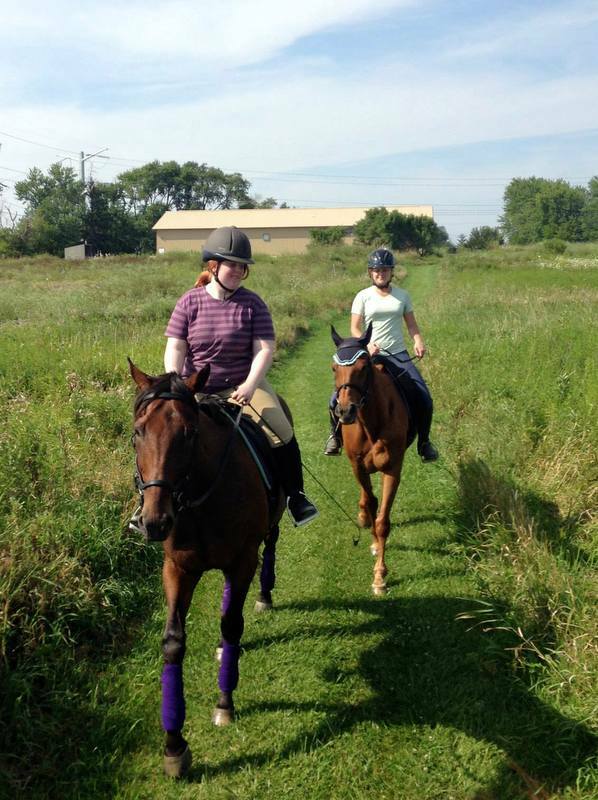 The day of the downpour, Christy and I rode together, weathering a really loud thunderstorm with Derby and Remy, who both kept their composure nicely. I wasn’t entirely successful at navigating the water – I was able to kick a bug-eyed Derby across it but we didn’t get to the point where we were plowing comfortably through it like Remy was. As we untacked, I made a stupid comment to Christy, saying something along the lines of “I wish he’d go through the water more confidently,” promptly earning myself an impromptu lecture about riding more confidently, and being unequivocal about going forward. The next day we got another shot at the puddle. We started walking around and through it, and the one time he tried to balk, I applied some vigorous encouragement with the whip and through we went. We traversed the length of the puddle nicely, and then gave trotting it a shot. Derby thought about ducking inward, but I had the presence of mind to really hold my outside hand, at the same time closing my legs and sending him forward. It worked, and we bounced through the goo, and then did it again a few more times for good measure. Summer school has been in session, and it’s paying off. 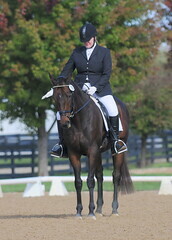 I’m eyeballing a schooling show in early October – we’ve done diddly this year, and I’d like to get off the property. However, we have more work to do before I bust out the white britches. We’ll see! C’moooon, those white breeches are aching to be busted out!